Regardless of their cultural background, every student in your class is likely to be familiar with fables. They are often one of our first introductions to the joys of storytelling. Of course, their merit lies not only in their huge entertainment value, but the fact that they are designed to teach us moral lessons. In Western culture, the influence of fables, particularly those of that wily old Greek Aesop, permeate our everyday speech. Everything from Don’t count your chickens before they hatch to Out of the frying pan and into the fire can be traced to the wisdom of fables. 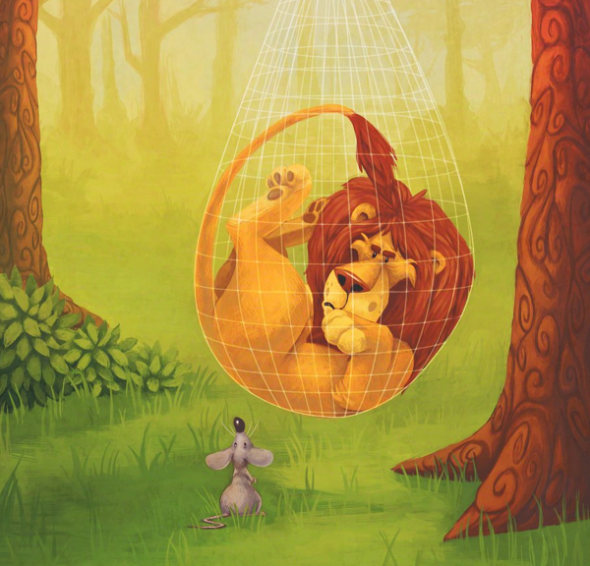 Given they are generally relatively short, very entertaining, and students are likely to have some familiarity with them already, fables make excellent resources for improving literacy skills. Read on to get more 5 interesting ideas on how to incorporate them into your lessons. Though fables can reveal to us much about human nature, it is interesting to note that the central characters are most often animals. This is true even in more modern versions of fables, such as George Orwell’s Animal Farm. This anthropomorphism can provide a great in for some very fun writing activities. Have younger children match personality traits to animals. This simple animal adjectives task consists of providing a list of adjectives and a list of animals. Students must match each adjective with the most suitable animal based on the fables they have been working on. You can further categorize adjectives in lists relating to size, shape, color, feeling, tone etc. This will open up learning opportunities for punctuation work too. Older students can undertake a similar activity, but incorporate their understanding of poetry techniques to write similes or metaphors based on the animals in the fables they have read. To broaden out their characters, students could also be asked to develop bios for each animal. As mentioned, these pithy little tales convey morals to readers. Indeed, back in the days of togas and scrolls, the Greeks would use fables to teach their society how to live the virtuous life. Encourage close reading skills in your students by having them identify the moral of a variety of fables. TEACHING MORALS IN THE CLASS TODAY CAN BE DIFFICULT. bUT FABLES OPEN UP THAT CONVERSATION. As many of these stories date back over 2,500 years old, copyright is unlikely to be an issue! You can find tons of free versions of Aesop’s fables online. Print a selection off, organize your class into groups, give them copies of the tales, and set them the task of reading and identifying the moral of each one. This activity is easily differentiated by the language level of each version. There are numerous versions of Aesop’s fables available for download online. Choose the version that best suits your class, group, or individual’s needs. For younger students, or students of lower ability, you may wish to provide the group with a list of morals from which they have to choose to match up with the appropriate fable. FABLES CAN MAKE YOUR CLASSROOM A PLACE OF BEAUTY AS WELL AS A GREAT LEARNING EXPERIENCE. Sequencing is very important in storytelling; in fact, it’s very important in all writing genres. Having a firm grasp of the importance of good sequencing helps students organize their writing at the planning stage. There are many possible variations of sequencing activities you can set your students. Very young students can be given a series of jumbled up pictures of scenes from a fable you have already read to them. They are tasked with putting the pictures in chronological order and sticking them onto a strip of paper. They can then use these as prompts to tell each other the story in their own words. This activity can easily be modified to challenge stronger students. For example, you may provide a set of corresponding captions that must be matched to the pictures before organizing chronologically. You can further differentiate by introducing non-conventional story structures such as In Media Res where a story starts in the middle. Students will likely have some awareness of this from its frequent use in the movies. Have them play with the sequence of events and try different starting points for effect. This can reap great creative rewards in their writing later. View our premium 97 page fable unit: No prep required! ✔ What Is a Fable and Its Purpose? ✔ Who Is Aesop, The Father of Fables? ✔ Fable Glossary and Curriculum Links. Just as scientists can understand the inner workings of a frog by dissecting it, students can understand the inner workings of a story through the same process. Hopefully though, the magic of storytelling survives the process, unlike the poor frog! Use a fable your students are very familiar with to teach the essential parts of a story: character, setting, problem,climax, and resolution. Discuss the characters in the story and have them identify the setting. Discuss the links between types of character and suitable settings. Broaden this idea out to other writing genres such as science fiction, westerns, and horror. What patterns can your students uncover about the relationships between characters and settings? Now it’s time to get scientific! In groups, have students draw a graph with time along the horizontal axis and action along the vertical axis. Have students plot the various parts of the story (introduction of the characters and setting, problem, climax, resolution) as points along the axis. The points should move from left to right as they occur chronologically in the story. The higher the point is, the more dramatic the action. This is a great way for students to see the physical shape of a narrative arc. A simple version of this activity may involve students simply plotting the points and labeling them introduction, problem etc. However, more advanced students can also write captions that describe the action at the different stages. You may also wish to take the opportunity to make some cross curricular technology links here and have students construct their graphs digitally with a suitable software program. Anthropomorphism - LOOK IT UP WITH YOUR STUDENTS. eXCELLENT LITERARY CONVERSATION. Though many of traditional fables date back to around 500 BC, they have survived due to the timeless nature of their messages and the generality of the characters and settings. 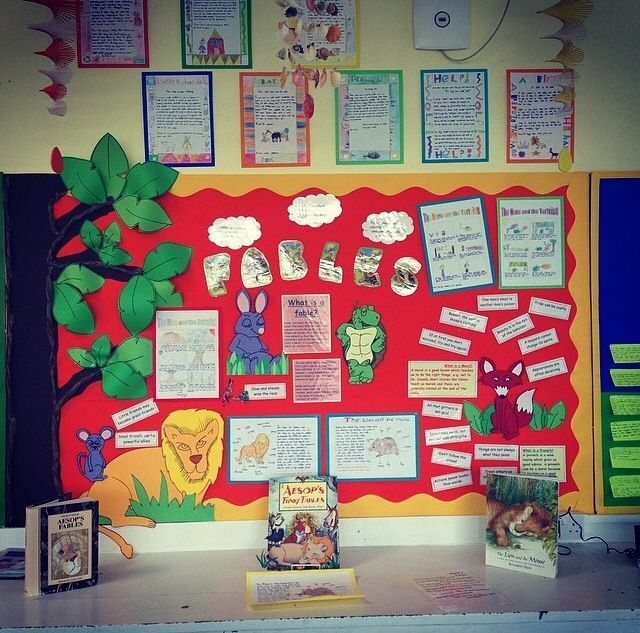 Now your students have a good understanding of how they work, have them rewrite the fables for the modern day. This will require them to get specific. Characters will become human and locations will be defined. This is a great way to reveal to students that the same theme can be given a number of different treatments; stories that seem markedly distinct can share an underlying moral. This activity can be differentiated by outcome, whereby more able students will produce more complex stories. While the less advanced students may stick tightly to the original, more advanced students may completely reinterpret the story with only the central moral remaining intact. The activities above can be used as one-off lessons or as a series of lessons exploring different aspects of fables: character, moral, sequence, and story structure. There is also a lot of scope here for continuing work based on the initial fables. Time spent getting to grips with a story can be utilized in other genres and for other learning objectives too. Perhaps you want to teach the writing of playscripts? You can teach the criteria for the genre and then set your students the task of adapting a fable to the playscript format. This tool assists students to create engaging fables based upon the model we have been using for generations. It is best printed in a larger format so as your students can visually represent their ideas alongside written ones and is completely free and available here. Getting younger students to record their ideas in a logical and engaging manner can be tough. If you have reluctant writers in your classroom, you will appreciate how difficult it can be to get work from them demonstrating a clear understanding of what you have been teaching them. To counteract this issue I find Adobe Spark Video to be an incredibly easy to use on all devices. It is a powerful tool which as the name suggests relies mainly on visuals and images to share knowledge as opposed to writing down line after line of text. The other great thing about Adobe Spark Video is the polish it adds to presentations that make them far more engaging than your traditional PowerPoint or Keynote presentation. Simply giving students Adobe Spark Video and directions around a specific topic can sometimes leave them confused and seeking further clarification. Snapshot Writing is a great way to get students to write about an exact moment in time. It is an opportunity to laser focus on how our senses and emotions react to the world and events around us. Using this tool students simply write what they see, hear, feel, smell, see and taste. This is a great task to aid students to create imagery within their writing. It is always written from a first person perspective and will force your students to think outside the box when describing any event or action in future. We are giving you this free great planning tool which makes Snapshot Writing accessible to anyone. Download it here. Snapshot writing is greatly enhanced when used alongside a visual prompt such as a photo or video. It will enhance any writing session and give a great deal of confidence to reluctant writers. If you are looking for a collection of amazing visual writing prompts and an editable version of the snapshot writing tool which can be found here. This week we are giving away a freebie to one of the most loved children's books of all time. Charlie and the Chocolate Factory. Click here to download the freebie and if you really want to go all in Charlie and teach a complete unit on it I can strongly recommend this 57 page book full of great ideas about Willy Wonka and his amazing chocolate factory.